Like other religious publications, Haggadot for American Jews in the Armed Forces were often produced by the Jewish Welfare Board. This began in World War I when approximately 225,00 American Jews served in the war. Haggadot were also produced for Jews in the German and British armies. The books in the museum’s collection aren’t as visually stunning as some historic haggadot. But the graphics are often quite informative about a time and place. They’re less likely to be filled with beautiful poetry. But they tell fascinating stories about the observances of Passover in the military at wartime. By World War II, there were approximately 550,00 American Jews in service (and another million or so from other countries). Haggadot for members of the Armed Forces were produced by multiple sources both within and outside of the military. Some of these had unique and personal elements. The U.S. Army’s 42nd Infantry Division produced their own Haggadah in 1945. “It was printed by the press which prints our Division newspaper. The press uses the photo-offset method. The Hebrew text was taken from the prayer book for soldiers issued by the Jewish Welfare Board. It was prepared to be used at our division Seder which was held in Dahn, Germany. The Haggadah begins with a message from Major General Collins: “My Jewish Soldiers– The celebration of Passover should have unusual significance for you at this time, for like your acestors of old you too are now engaged in a battle against a modern Pharaoh. This Pharaoh has sought, not only to enslave your people, but to make slaves of the whole world.” The service is written almost entirely in Hebrew. It ends with an English “Prayer For Home.” Rather than a traditional Passover song or “Next Year in Jerusalem,” the final song is America (My Country, ‘Tis of Thee). The Rainbow Haggadah is one of many objects that shows the great pride Jewish American soldiers felt at defeating the Nazis. Re-instituting Jewish culture and religious practices was the greatest statement of triumph they could make. This seder on German soil showed the importance of winning the war for the Jewish people. The Jewish Brigade was part of the British Army. It was composed of Jews who lived in Palestine and was commanded by British Jews. During World War II, they produced Haggadot for soldiers serving in the Brigade. This one was used in 1945. It was common for Jewish Americans to seek out fellow Jews wherever they were serving. In March of 1945, Captain Lewis Cohen found Jewish community with members of the Jewish Brigade at a Passover seder in Italy. Cohen was serving as a medical officer with the 755th Tank Battalion of the U.S. Army. He connected with the Palestine Jews of the 179th Transport Company (Jewish Brigade). He and five enlisted men traveled to a large tent on the banks of Lake Trasimine near Perugia for the seder. Others in attendance included a British Colonel, a Jewish physician from the Polish Army in Exile, and a South African Jew. Cohen saved the Hagaddah of the Jewish Brigade that they used for the occasion. This Jewish Brigade Haggadah was modified with handwritten notes for use by the 179th Transport Company. The pages are loaded with the signatures of those who attended the Seder. Some are written in English and some in Hebrew. Along with unit designations, many of them include home addresses, most of them in Jerusalem. Some were students at Hebrew University. The Haggadah itself has a homemade feel. Each page has an illustration. Most of them illustrate the Passover story and the Exodus from Egypt, but some contain Zionist images. The Hebrew text intersperses handwritten and typed pages. The final page is dated 28 March 1945, the first night of Passover. 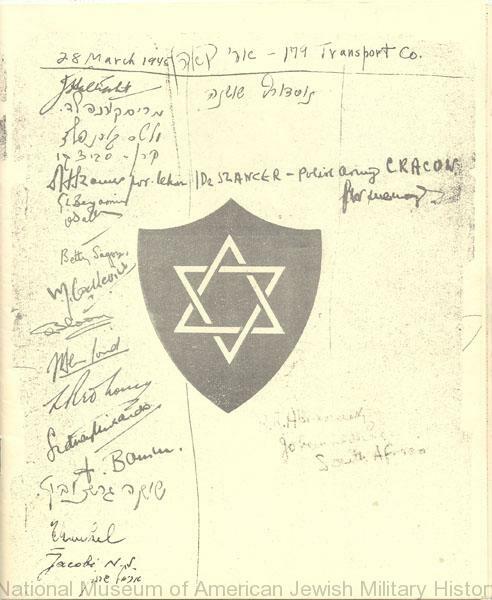 It contains more signatures, including names from Poland and South Africa. This Haggadah shows the importance of community to Lewis Cohen and other Jews who served in the Armed Forces. This Jewish community was created beyond nationality. Passover was an opportunity to come together and observe the holiday in the unique way that wartime allowed. A page lays out the order of the seder and diagrams the seder plate. The rest of the Haggadah is entirely in Hebrew until the end matter. The only image included in the entire Haggadah is a “View of a Jewish home in Morocco” picture. The societies who produced this Haggadah seem intent on letting the American soldiers and sailors know that there is an existing and very old Jewish community there. Indeed, some Americans did connect with North African Jews as A.J. Callner described in his memoirs. Americans had been fighting in North Africa for about a year when this Haggadah was used. Axis forces would surrender about a month after Passover, ending the North African Campaign. Other than the Haggadah itself, we have no records of what happened at this seder. But it’s easy to imagine that young Americans risking their lives in a foreign land found great comfort in the rituals of Passover. The connections with the North African Jewish community surely helped morale and contributed to the war effort. Please support our programming with a donation.